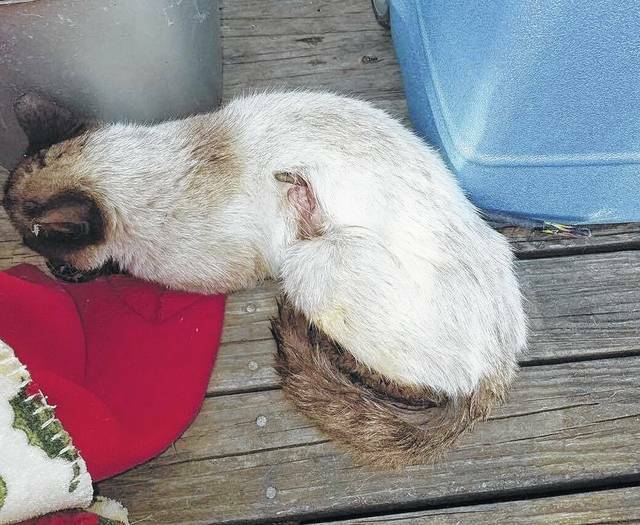 BUCYRUS — The owners of a Siamese cat, who was put down recently after being shot with an arrow, are seeking information about the person who fired the shot. Leslie Shaffer posted information about the shooting on the Inquirer Facebook page this weekend. The cat belonged to Laura and Brian Seybert. Laura Seybert is Shaffer’s mother. Brian Seybert is her stepfather. “If anyone knows who shot my mother’s Siamese cat with an arrow, please let us know,” Shaffer asked. They Seybert’s live near Abbotts Auctions on Old 330 in Wyandot County, just outside of Bucyrus. “This is animal cruelty and these individuals or individual need to be charged accordingly,” Shaffer said. Shaffer reported that Patsy had to be euthanized due to the injuries. The Seybert’s veterinarian said the cat could not be saved as the pointed end of the arrow was lodge in her abdominal area, near the ribs. “We are still looking for those involved. The arrow will be returned from the vet to my parents so they can turn it over to law enforcement,” Shaffer explained. If anyone has information on who shot Patsy, call the Crawford County Sheriff’s Office at 419-562-7906. Or contact Brian Seybert or Laura Seybert on their Facebook page. If you have information, you may also reply to Russ Kent at civitasmedia.com and he will relay the information. Courtesy photo Patsy, a Siamese cat, was euthanized recently after being shot with an arrow. Patsy’s owners are looking for information about the shooting. http://aimmedianetwork.com/wp-content/uploads/sites/38/2017/06/web1_injured-cat.jpgCourtesy photo Patsy, a Siamese cat, was euthanized recently after being shot with an arrow. Patsy’s owners are looking for information about the shooting. Russ Kent is editor of the Galion Inquirer. Email him at rkent@civitasmedia.com with comments or story ideas.